The status of our Depron foam kits on this site reflects what is left in stock, if you don’t see it we are no longer stocking it. The remaining stock of 9mm foam has been holding up well, it looks like we still have enough to carry us into the summer of 2018. After it’s gone there will be no replacement and DWFoamies will shut down shop. DWFoamies success over the last 12 years has been largely due to our amazing customer base. We would like to thank you for your support. For extreme 3D we suggest 40 degrees on both surfaces. With casual flying all that is needed is 40 degrees on one surface and 10 on the other and it doesn’t matter which surface gets the different angles. All of the surfaces are top hinged with Blenderm tape, cut your bevels with a new blade, slide the two halves together and tape Next, fold the surfaces back onto each other and tape the exposed beveled edges on the bottom, this will give you the strongest hinge. Blenderm tape, manufactured by 3M, is the preferred tape for all Depron foamies, it sticks well and holds up to quite a bit of abuse. Our foamies are cut with a high speed router and are sold without beveling. Over the years many customers have requested an option to have the surfaces pre-beveled, making hinging easier. We now offer beveling and taping as an option. Remember, it is best to bevel before you paint. …when you fly into something that has more mass and/or much harder than your foamie and your plane loses the battle. Here is a trick that I use… Turn on a household iron or your Monokote iron, at full temp, and with a very damp paper towel folded in quarters, you can steam dents and compression marks out of your foamie. Depron can be heated up to about 200 degrees before it starts getting soft, dents steam out at just under that temp. Try it on a sample and you will be impressed with your results. Doing this multiple times over an area will usually bring it back to its original state. Do all of this before you do any gluing or your results will not be as good. For repairs, I suggest using Gorilla Fast Cure polyurethane glue. It’s a foaming glue and works great for filling gaps, it holds up well to flexing and is less money than brittle CA. I only use the Gorilla glue when you can contain it with masking tape, after it dries pull the tape of quickly and it will pull the bleeders off the smooth surface of the Depron foam. Over the last couple years Depron has been coming in with a slight cup to it. The 3mm and 6mm sheets are workable, but lately the 9mm has more cupping than some customers like. The manufacture pretty much says “Take it or leave it”, being that it comes from Germany and there is no other source in the USA, I’m stuck with what I get. Below are a few steps that will allow you to get it flat again. 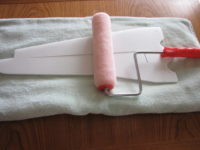 To flatten the foam we suggest a paint roller, a pie crust roller or a piece of large PVC or cardboard tube. Take a couple large towels and fold them in half to make a nice cushion. Lay the parts out on the towel, with the high point of the warped foam facing up and roll the foam with moderate pressure Take your time and don’t try to do it in one pass. 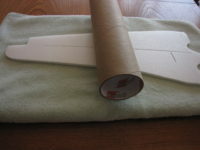 It is best to do this technique after you have taped your hinges and before you assemble the kit, if it’s completed you can have someone help by holding the wing while rolling the foam. Just be careful around the areas with sharp corners like counterbalances and also with cutouts like servo mounts. You can still work over them but keep off the heavy pressure while rolling over these areas. Keep in mind that with the tabbed design of construction, the fuselage straightens out quite well when assembled and the wing spar and the taped hinge line removes most of the warped foam. 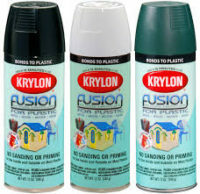 I’ve used the Krylon Fusion (from Wal-Mart) with good results, but you need to be careful on how you use it. Make sure that you spray light coats, let them tack up and you keep the nozzle about 12-15″ away from the foam. I have also had great results with the Testers & Model Masters paint from the hobby stores using the same technique. If you use Krylon H2O, make sure that you spray lightly around the masking, or else it will bleed under. H2O is an environmentally friendly aerosol paint with practically no smell and a short drying time. The paint is meant for wood, metal, plastic, glass, concrete and stone surfaces in addition to covering cellular plastic in indoor and outdoor environments. H20 is both weather and waterproof! When using any spray paint, use a poster board or heavy paper to make a mask, make sure to save the opposite side to create drop shadows. Use small straight pins at an angle to hold the mask down, the small pin holes will not be visible. Yes, sharpie markers work great. First off, prior to any gluing, make sure that you wipe off the smooth surface of Depron with alcohol to remove any oils on the surface. Never glue the leading and trailing edge of the wing to the fuse. Use a small amount of glue about 1″ in from the leading and trailing edges, this will allow the fuselage to flex, preventing hard points and cracks to start at the joint. Foam Safe CA and Foam Safe Kicker- Works great, used with kicker, dries instantly. Great for field repairs, in case you happen to break something. Usually dries clear, and makes for a great way to keep the plane clean. Gorilla Fast Cure- Generally messy, but works fine. Used in small amounts, keeps weight down. We found that it works best on the end grain of the foam, especially in repairing a broken nose or wingtip. Use it only where it can be contained, never at the intersection of the horizontal and vertical fuse. Over time, it turns a dark brown color, which makes the plane seem a bit messy. 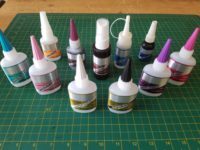 Elmer’s Craft glue- This type of glue works fine, but takes hours to dry, usually overnight. Dries clear, making final product very clean. Glue can break easily so use in large amounts. Epoxy- 5-minute works, but 15-30 works better. Generally a bit messy, and sometimes dries with a green-ish color. Great for mounting the motor or other high stress sections on the aircraft, such as the wing spar. If you get sloppy, it will clean it up with Denatured Alcohol. “Welders” – This is the same as contact cement (in a tube). Apply a thin amount on each surface, let it get tacky then stick the surfaces together. The works great on EPP for, but it will MELT Depron. “Aleene’s Craft Glue” (available at Michaels Crafts)- A PVA style glue that can be purchased at craft stores. Similar to white Elmer’s Craft Clue, but is thicker. Works great along the sides of the fuse after assembly. Hot Glue- Generally is messy, but can dry clear, and makes a nice flexible bond, which holds great. Be careful to not use high temperature hot glue! Don’t use in areas where the temperature regularly gets above 80º Fahrenheit (or about 28º Celsius).